Alpha SV Jacket - Mens is rated 4.8 out of 5 by 50. Rated 4 out of 5 by jack from Needs bigger pull tabs There are already hundreds of reviews on this jacket praising almost every aspect of this jacket. And I agree completely with them. The ONLY flaw with this jacket are the size of the pull tabs. For a severe weather jacket, which will mostly be used with gloves, the pull tabs on this jacket for hood adjustment, pit zips etc are just way too small. When it gets serious on the mountain and you have to make a quick descent, you don't want to fiddle around with your hood adjustments for 5 minutes and stop to cinch down your hood; you want to do that on the MOVE and not have to take your gloves off and risk frostbite. All in all, this is a superb jacket, but for the extreme conditions it is designed for, the pull tabs are just not up to the task. The safety gained from larger pull tabs far far outweighs the minimal weight they will add. Rated 5 out of 5 by James765 from Batman's own gore-tex shell So there's a preconception that this jacket is made only for mountaineers, etc.. But I like having top quality everything, so this jacket suits me well while hill climbing in Alaska, wearing around town in rainy weather, etc.. I also like that it's Fabrique au Canada. I've worn it this past Summer in Alaska during rainy hill climbs which turned very windy and cold up toward the top of the peak, and it performed perfectly. It was unobtrusive, and was like having my own mini-shelter (I didn't feel any of the elements to be honest). Highly recommended. Rated 5 out of 5 by Bones from Get one I have the "pelican" color I snagged in LA when I was at USC. I was at an outdoor store being a north face fan back then in 2002. The person helping me said to forget TNF and to check out a newer company out of Canada. 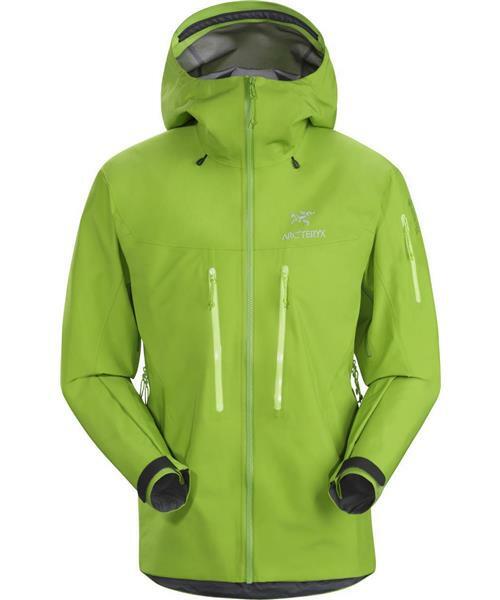 Im so glad I did and Ive been an Arcteryx junkie since. The XCR on mine has been a perfect shelter from any storms Ive skied or boarded in here in the San Juan Mtns of Colorado. The jacket is 10 years old now. I havent noticed any fading, zippers still work perfect, love the hood, seems to be bullet proof to anything mother nature dishes out. Im 5'11" 195 lbs and I love the XL Arcteryx jackets. Room for a mid layer. If I had to get another shell today, Id go with this Alpha SV...especially since they are proshell now. Rated 5 out of 5 by Tigger from Great Product! Have only had this jacket for a few weeks but it fits well for my size (6'4" 250) and leaves enough room for layering. It provides excellent protection from the elements. If you have never had a jacket of this quality you should know that water just sheds off even in the heaviest of downpours. The pocket layout is perfect when wearing a pack. It's held up to the abuse from hiking well over 100 miles in the southern Arizona mountains through cacti and rough brush with out showing wear. Looking forward to many more "tests" of durability over the next several years! Rated 5 out of 5 by Captainsteve from The Bomb Shelter... This Jacket has endured 4 months of Alpine Climbing in the southern Patagonian Ice Field, over a dozen ice climbing and ski touring forays into the northern Cascades and has been to the top of Mt. Mckinley. It doesn't sag or wilt after extended exposure to humidity or moisture and the fit accommodates virtually any layering system and it still looks and smells new! Rated 5 out of 5 by wallrat510 from This jacket is bombproof! If I didn't know any better I'd swear this jacket was made out of Kevlar. This is the most durable feeling jacket that I have ever used. The fit and attention to detail is simply amazing. Watertight zippers, just the right amount of pockets and a hood that actually makes sense. I can't tell you the number of times people tell me how great this jacket looks. Sure they are expensive but by the feel of it I'm sure this baby will last for years. Don't think about buying one, just buy it and stand out from the crowd, you deserve it. Rated 5 out of 5 by Tyinblue from An Epic Jacket I got my Alpha SV in 1998. It's been everywhere, in all sorts of weather. I use it as a raincoat and a shell. Pushed through heavy brush and been wadded into packs. It's held up like nothing else; I've worn out cars since getting it. The zippers are still good, the stitching is good, the tape is still good. What more could you ask? Rated 5 out of 5 by DomL from A suit of armour. Within the first few seconds of trying this jacket on, you instantly realise the difference between this and just about any other shell on earth. The superiour fit, movement, and incredible attention to detail is immediately obvious. Take it out on the hills and mountains of the UK and Scotland, and this initial impression is reinforced more and more with every passing minute. Durable isn't the word. It feels like a second skin, only one too tough to punctuate. Everything is put exactly where it is needed. The pockets, pit zips, hood adjustments, everything is perfect. The hood is the best I have ever used, and I have used most. The performance of the fabric is considerably better than other three layer Gore-Tex constructions I have ever used. A costly investment, but given the level of consistency of performance, consistency which has so far lasted years, still a very, very prudent one. Cannot rate highly enough.